Here we are again at the end of another week. Sure has been busy. First, we want to send lots of light and love to my mom/Harrington and Hannah's grammy that she is ok and home from the hospital. Had a little heart scare Wednesday. Next, we want to send lots of light and love to friends that have had some bad health news, friends who have lost loved one's, friends who have lost pets, friends who...well, just need a darn HUG! We love you!!! Laying under the triangle willow tent will allow you to form a perfect 90 degree angle with your partner. Thus allowing the stars to align, the moon to smile and treats to be delivered in a timely manner. However, you must meditate in this direction for ten minutes and then share it with 50 other people on the internet. If you don't share it with 50 other people, it will break the chain and you will have bad luck, and no treats for the rest of your life. Not to mention the moon will be cranky and not smile. Sometimes you just have to stretch it to get your point across. "No, Hannah is not campaigning for president." It's not belly up to the bar. It's belly up to the buffet. "Don't even think of touching my pellets. They're mine...all mine!" Somebunny needs a darn pedicure! Ewwwwww! The hidden message in the bunny fur. Hmmmm..... What do you see? "Harrington, Mama has totally lost her mind." Happy Friday! We love you and send you lots and lots of hugs! Hi there! Today I wanted to share with you that I am honored to be a guest designer this month in Elefantz Home Magazine. My dear friend, Jenny Reynolds, is the publisher of this wonderful emag, a very talented designer, and one fabulous lady! This month is her Garden issue as it's Springtime in Australia. If you are a subscriber to her magazine, you know there are many wonderful patterns and projects to make. I designed this little stitchery for this issue. It's called "A Sampling of Home." So hop over and read more about it. Sign up for Jenny's newsletter while you're there and subscribe to her wonderful emag. There's lots of fun to be had! Tell her me and the bunnies say hi! We'll see you right back her on Friday. Today we are back to work and ready to announce our Dot's Hop Winner! 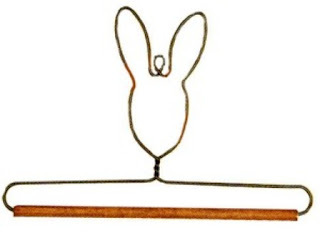 Congratulations to Vicki T (no blog) on winning the bunny hanger! Send me your address Vicki and I'll get your prize in the mail to you. Then, starting next Monday, October 1st, will the the kick off to the "Leafs Me Happy" blog hop hosted by Cherry of Cherry Blossoms Quilting Studio! Our day to participate will be October 5th. There will be a giveaway then too, so hop over and visit us! This will be the last hop I will be able to participate in this year. I have so much work to get done before I leave for quilt market the end of October. I also want to take this time thank you for your kind comments. I love reading each and every one. I truly wish I could respond to you, but most times I'm reading them from my phone on the way to something. There just aren't enough hours in the day. Please know I'm thinking of you and you bring a smile to my face when I read your words. Have a fun day and we'll see you on Wednesday with some exciting news! "Today, Harrington and I thought you would like to enjoy a visit into Mama's imagination. 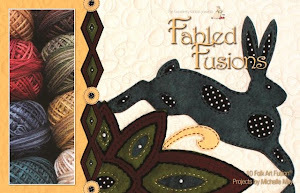 She's been asked lots of times where she get's her ideas and inspiration for her Folk Art Fusion designs. Well, we can tell you that she get's it from us, music and stories. Her style is like a folk art fairytale." "Mama is always listening to music in Bunnyville. She likes all kinds of music. That Pandora lady sure does have lots of tunes. In fact, the other week Mama was listening to this song by U2 called Beautiful Day. You can play it if you'd like to listen and keep reading." "The beginning lyrics of this song say 'The heart is a bloom, shoots up through the stony ground.' This made Mama jump up and run for her pencil and paper. She said, 'I just got the bestest idea!' Then she does the happy bunny dance for a few minutes as she let's the words in the song sink in. She'll jot down little things that have meaning to her." "Next she gathers some paper and her pencil. She looks at the words she jotted down, looks out the window and thinks about them. Then, she may draw and draw and draw for hours to get a rough sketch. She likes the words to speak to her. She draws everything by hand. Nothing is computer generated. Mama likes to connect to her art through the feel of pencil and paper. She say's that's the only way the story in her head can come to be." "From here she spends lots of time gathering fabrics and threads that go along with the story. This usually results in a really big mess in Bunnyville." "Next she starts to work on the piece. 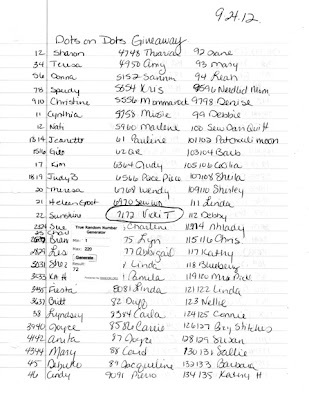 As she's working on it, she jots down measurements and notes that she will use when writing the pattern, or putting it in another book. If you have made one of her Folk Art Fusion projects from Briarside Lane, you know that there is lots of hand stitching. Mama really loves to hand stitch. Once the piece is finished, she will spend many hours writing out each step, redrawing the original sketch to a finished design, and photographing the piece so she can share it with you. She say's that being able teach someone how to quilt and how to create something with their own hands is truly rewarding. She say's 'there's an artist in everyone and a child that wants to come out and play. The world needs more handmade and less made in China.' She loves it when people purchase her designs and books and are excited about playing and having fun." "During it all, Mama always comes over to snuggle with me and Harrington. We always make her laugh and inspire her with our antics. 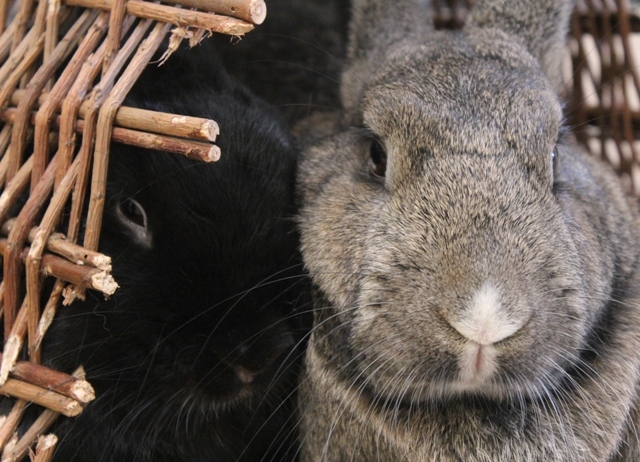 There is great love and kindness here in Bunnyville. It is the perfect place for imagination to run free." Our Day on the Dot's on Dot's Hop! Woo hoo! It's our day and we are so excited! We want to send a special thank you to the lovely duo, Corrie and Des of Quilt Taffy for hosting this fun hop and we also want to send big hugs and thanks to the fabulous Madame Samm for organizing these events! The bunnies and I are excited to release our new Folk Art Fusion pattern, "The Hare's Lair." This 12" mini quilt combines wool applique, hand stitching, hand quilting and a few embellishments like buttons and beads! This is the perfect little project to carry along with you to appointments, soccer games, or travels. Hand stitching is so relaxing and with our busy lives, we could all use a little relaxation while at the same time being productive! The Pattern and Kit's (sold separately) are available in our SHOP. This mini quilt fit's perfectly on this 12" x 14" Table Stand. 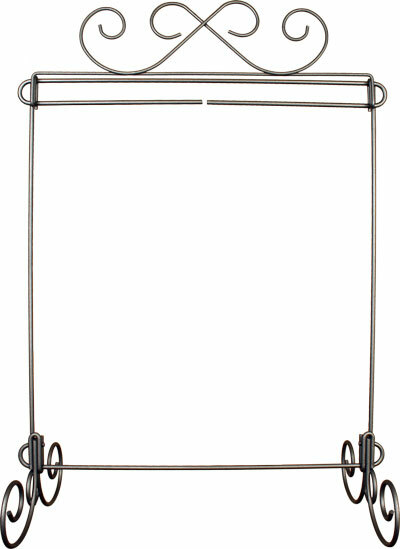 Remember, these stands and all the hangers have been marked down 15% in our shop. Once they're gone, they're gone. We won't be carrying them any longer. 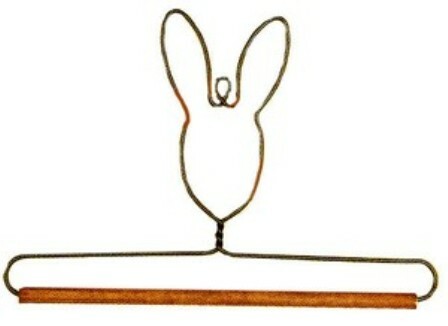 In fact, we decided the last 6" bunny hanger would make a really fun GIVEAWAY for this hop. To enter the giveaway leave a comment on this post. If you are signed up as a follower (on the right) then you get two chances! The bunnies and I will use the random number generator to select the winner on Monday, September 24th. Now we invite you to hop over and visit these lovely bloggers who we are honored to share this day with. Happy Hopping! The Dot's on Dot's blog hop continues on this week. Have you been having a good time visiting everyone? I finished my new Folk Art Fusion design for the hop. It's called, "The Hare's Lair." The colors made me smile big when I started playing with them. The pattern and kits will be available in the SHOP on Wednesday when I will show you the finished "Hare's Lair" piece. Hannah's lair is always by my chair. She likes to be a part of the design process. Hop over and visit the other wonderful participants in the Dot's on Dot's Blog Hop. Woo hoo! Here we are at our most favorite time of year! There's just something about September through December that is so fun and magical for us! We love it! How are you coming along with your blocks? Hmmmmmmmmmmm? Are you behind? Are you all caught up? Are you just collecting them for a rainy day six years from now? hee,hee,hee. Well, this month Harrington and Hannah have are having a nice little chat with William, the bookworm, about teachers. You see, they think teachers are awesome! They think teachers have a most difficult job in these times! They think teachers should be paid lots and lots of money for all that they must go through! Without teachers, where would we be? So thank you dear teachers for all that you do to inspire, guide and help us to learn. We are ever so grateful to you! Here's how they all look together. Hop over to our Shop and get your Free pattern. We still have kits available if you would like to join us. Note, once the fabric kits are gone, we won't be getting any more. Don't forget to add your photos to the Flickr group! Lots of creative friends over there! "We would like to remind you that the next block in 'The Adventures of Harrington and Hannah' will be available tomorrow." "I think that was pretty darn good Harrington. You're a natural announcer. I bet you could get a public speaking gig." Happy Friday and we'll see you tomorrow! How has your week been so far? Have you been over to the Dots on Dots blog hop? Fun isn't it? Just a reminder that my BUNSALE ends at 10:00 p.m. tonight. Hop over to the SHOP and enter BUNSALE in the coupon code to receive 15% off your entire order. Last week I did a post called Handmade Hugs about a quilt I made for my sister from my grandmother's shirt. I loved reading each and every comment and so glad it brought you smiles and memories of people that were important in your life. One of my best customers, Sharon Decker, who has since become a very good friend, shared this with me and I just had to share it with you. I loved your little framed quilt. I love using the pockets in memory quilts. My niece's husband died almost 2 years ago at only 46. I offered to make quilts for her and their two daughters and one son. I made quilts for each of the kids and something special for Jenny, my niece. I had been making the appliqued pieces from "Affairs of the Heart" and had quite a few done. Jenny sent me two shirts of Dan's that she really liked and I used those to make her a jacket. I used the shirt they bought when they took a trip to Hawaii as the sashing between the brightly colored "Heart" blocks. For the lining, I used almost all of one of the shirts. Now when she puts the jacket on, she is "hugged" by his "arms" because the sleeves of the shirt are now the linings for the two sleeves and the body of the shirt is the lining for the body of the jacket. I thought it was a fitting tribute to a very nice person who was loved by all who knew him. Here is what the jacket looks like (and my husband Al). " Sharon told me that Dan died from cancer. He passed away quickly after his diagnosis. I think this jacket was such an incredible gift for her niece. I can't imagine the pain she will always carry with her knowing her dear husband left this beautiful world so early. Thank you Sharon for allowing me to post this. Thank you also for your friendship. Quilting has a way of bringing people together. Patching together bits and pieces of all our lives, the celebrations, the heartaches, the wins, the loses. Truly it is quilting a friendship. Dots Hop and a Sale! Are you ready for a fun week? Woo hoo! I am! First, today kicks off the Dot's on Dot's blog hop hosted by the lovely ladies of Quilt Taffy, Corrie and Des! CLICK HERE to view the schedule of participants. 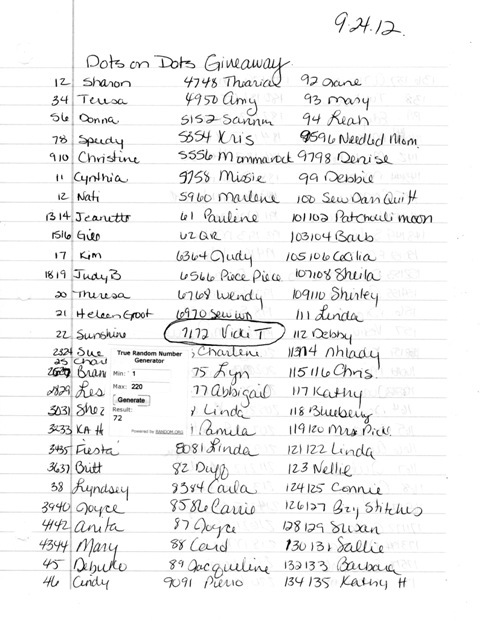 Our day to show you a new pattern is Wednesday, September 19th. 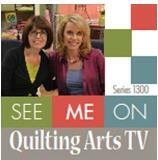 Also, be sure and visit the fabulous Madame Samm over at SEW WE QUILT for the daily wrap up and prizes! Yippee! Next, if you saw Friday's post, you know that today starts the BUNSALE in the Shop. Simply enter BUNSALE in the coupon code area when you check out. Your entire purchase will receive a 15% discount! Like Autumn, the winds of change are coming. There will be many changes to my Shop and designs in the coming months. I'll have more on that later. How long have you been using those dull needles in your sewing machine? Hmmmmmmmm? Have you been waiting to get a quilt stand or hanger? Hmmmmmmmmmmm? These have already been marked down 15% and now you'll get another discount! I won't be carrying these anymore, so get them at this fantastic price before they're all gone. 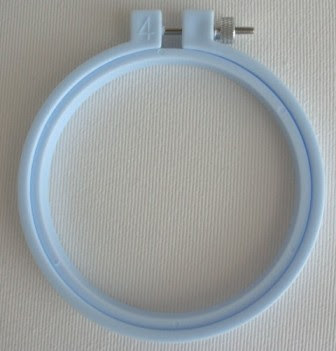 What about a new hoop for your stitchery projects or maybe getting one for that little girl this Christmas and making a starter stitching kit? Hmmmmmmmmmm? How is your collection of Valdani 3 strand floss coming along? Little balls of happiness! We still have Harrington and Hannah BOM wool, floss and fabric kits available. Not many though. Once these are gone there won't be anymore. Remember, just enter BUNSALE in the coupon area and receive 15% off the entire order. This sale will End this Wednesday at 10:00 p.m. Eastern time. So, hop over and get your goodies while the gett'in is good. Hugs and have fun hopp'in and shopp'in! "Mama has had a very busy week. She's been looking over her bookkeeping, shuffling lots of papers and mumbling to herself. She has decided to have an inventory reduction sale on Monday! She said it's time to move some things out and get ready for the new." "Please visit our SHOP on Monday to take advantage of this sale. 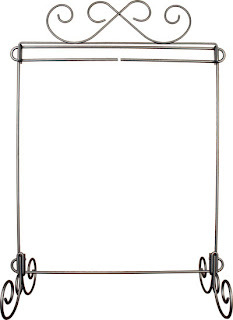 This is a great time to stock up on embroidery needles, floss, wool, patterns, quilt stands, machine sewing needles, etc. When you are finished shopping, simply enter BUNSALE in the coupon code area and your entire order will receive a 15% discount! This sale will run for three days only! September 10 through September 12." 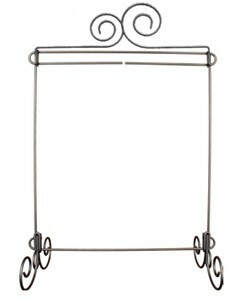 "Please note that quilt stands and hangers have already been marked down 15% so now they will be discounted again! Woo hoo! Mama will not be carrying these again when they are gone, so get them while you can." "Hannah... I'm sure glad Mama is having a sale. We need more room for our toys and snuggling." 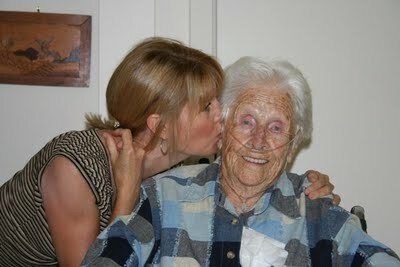 Three years ago, on August 26, my grandmother became an angel. After the service, my sister gave me a plaid shirt my grandmother always wore and said, "will you make me something with it?" I took the shirt and said I would. I've had the shirt for three years. It was in a bag and when I opened the bag, I was brought to tears by the smell of my "cutie" as I called her. When I would call her, I would say, "Hi Cutie!" She would always reply, "Hi Sweetie!" This was the year I would make something of this shirt for my sister as it is her 40th birthday. This is what I decided to make. My sister's house is small and she has three children, a husband, and a big dog. She has more wall space than anything else. I thought something in a frame would be nice. The center of the quilt is the pocket from the shirt. My cutie grammy always had a tissue in her pocket. I kept her tissue there. The label on the shirt read "George." This made me smile as my grandfather's name was George. They loved each other so very much and I decided it needed to go on the pocket. There are stars around the quilt as my cutie was a star to all of us. The thing I find rather magical is that my grandfather died in 1997. At that time my sister gave me one of his plaid shirts and asked me to make something. I waited three years and then made a quilt to give my sister to bring home her first child from the hospital in 2000. My niece, named after me, Laura Michelle. Then the same thing with cutie's shirt. Three years and then my sister's 40th birthday. Both quilts were made at a time when my sister could really use a loving hug from my grandparents. Quilts always seem to do that. They truly are handmade hugs. When I was in Virginia the other week, I went to a lovely thrift store called "Through the Garden Gate." My friend, Sharon, has a booth there. I'll have more fun things to share about Sharon in another post. We walked around the store admiring all the beautiful things that people had in their booths. All of a sudden Sharon said, "oh Shell, you might want to see this." She knew right away that I would fall in love and she was right! There sitting in a tall, handmade, chair was this beautiful handmade, folk art, bunny! I took one look at her in the chair and knew she was coming home with me right away! My niece, Noelle, was with me and we named her Noelle. I couldn't believe what a great find this was. First, the fact that it was a folk art bunny and second that it was handmade and not stamped "made in China!" Woo hoo, double bonus! Somebunny's trash became this bunny's treasure! Next, my friend and very talented artist, Joanne May, created these earrings for me to wear to Houston in October. I have several pieces of jewelry that Jo has created specifically for me, and I treasure them. 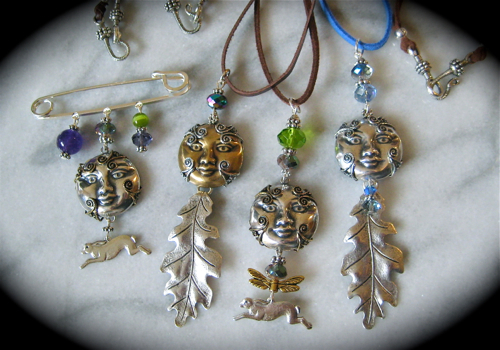 I saw these pieces on her blog and fell in love with the moon and hares. I contacted Jo and asked if she could make me some earrings. As always she created exactly what I had in mind. Thanks Jo! Next, I was visiting the blog of my friend, Anita Rivera. Here blog is truly magical. She had posted on these gorgeous tags she created. I took one look at the fairy holding the bunny and then the saying and hopped over to her Etsy shop as fast as I could to purchase them. I have several friends that will be getting one of these as a gift. Of course, I will be keeping one for myself as a bookmark. Anita even included a lavender castle soap. It too was handmade for Anita's shop by Robyn's Nest Boutique.Lovely. So, I invite you to go create something with your own hands, go shopping in a thrift store, or shop with artists you love. Support the labor of handmade. Wishing you a Happy Labor Day the USA.